Vert Attack is an annual skateboard contest held in Malmo, Sweden also known as: European mid-vert championship. The dates for next year’s Vert Attack in Malmo, Sweden, has been released. Here is the information. The event is held January 27-28 2012. The event is held at the indoor skatepark in Malmö and this time, it will be twice as good with an extra day of vert carnage. Vert Attack has almost become an institution for vert skaters and people are traveling the world to participate or just to witness this midvert festival. Let’s unleash the hype and get ready for rumble! 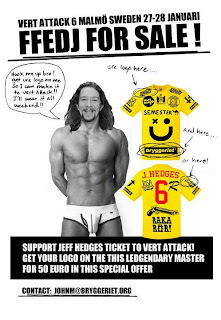 If you want to sponsor a poor yet awesome skater (like Ffej) for the event, click on the link.